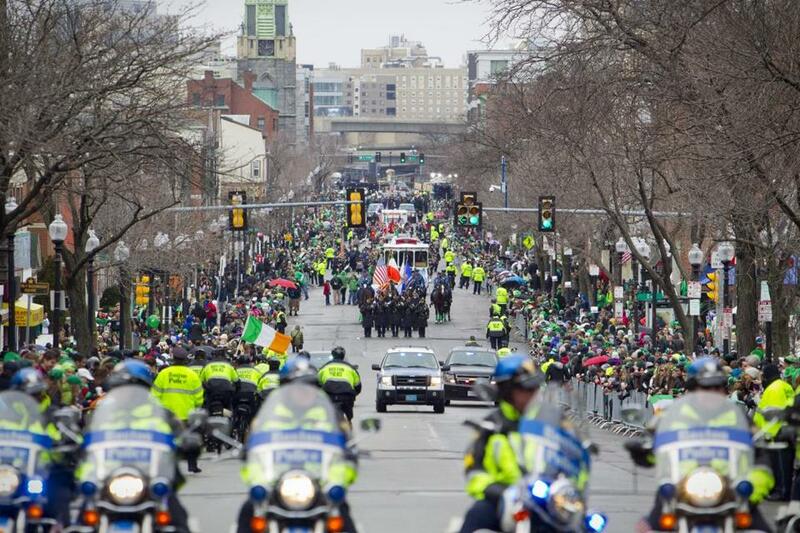 A federal judge has ordered that the Boston St. Patrick’s Day parade, seen here in 2015, can march along its usual route, rather than a shortened one sought by the city of Boston. A federal judge on Tuesday ordered the Walsh administration to allow the St. Patrick’s Day parade to march along its typical route through South Boston, saying the city’s attempts to shorten the parade, even if for safety reasons, interfered with the First Amendment rights of the organizers. Chester Darling, an attorney for the parade organizers, suggested the city’s attempts to shorten the parade were politically motivated; parade organizers have been at odds with Mayor Martin J. Walsh in recent years, based in part on the mayor’s failed attempt during his first year in office in 2014 to negotiate the inclusion of gay and lesbian veterans, who were allowed to march last year. Darling noted that the city for the first time this year requested an insurance binder and entertainment license. Boston’s police commissioner, William B. Evans, took issue with the claim, and said from the witness stand during Tuesday’s emergency hearing in federal court that he was the one who asked the mayor to adopt the shorter route — the same route the parade followed in 2015, when record snowfall clogged city streets. The commissioner described his growing concern that the “dynamic” of the parade has changed in recent years, with more unruly out-of-towners crowding the parade route and side streets: They drink alcohol openly, vandalize property, and urinate in public, he said. Evans said the number of people who congregate on roofs along the parade route and the fights that have occurred are growing concerns. He said the city was able to better deploy its resources last year, thanks to the shorter route. “It had nothing to do with anything political; this is strictly a public safety decision,” said Evans, who has lived in South Boston for 57 years. In granting the parade organizers’ request for a temporary restraining order against the city, Stearns said he recognized the legitimate public safety concerns that were raised by Evans and Superintendent Bernard O’Rourke, who oversees planning and the deployment of officers for the parade. But, the judge found, the city’s concerns would be better addressed by restricting the sale of alcohol along the route, or taking other public safety measures. With the judge’s decision, the parade on Sunday will traverse its traditional route down West Broadway to East Broadway, through South Boston and by Dorchester Heights, which has historic relevance to the Continental Army’s conflict with British troops in Boston in 1776. Parade organizers say the parade also recognizes Evacuation Day, when British troops evacuated the city during the Revolutionary War. Dorchester Heights was one of the locations cited by the city as a place where unruly crowds congregate during and after the parade. Evans said after the hearing that he recognized the First Amendment rights that the parade organizers and the judge cited, but that he thought the shorter route was still reasonable.